The Canadian Jewish population has seen only modest growth in the past 20 years, following a more significant increase between 1981 and 1991. 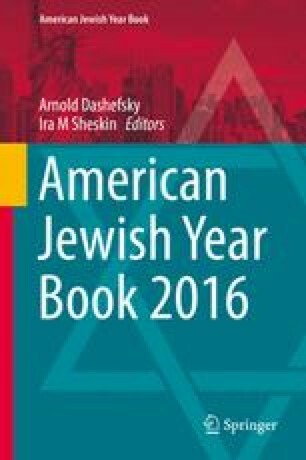 The latter decade coincided with the beginning of significant immigration by Jews from the Former Soviet Union. Jews reside in every region of Canada including the Northern Territories, although they are concentrated heavily in the major urban centers. The metropolitan area of Toronto is home to 188,710 Jews, and includes about half (48.2 %) of Canada's Jewish population. The Montreal community numbers 90,780 Jews. The median age of Canadian Jews is slightly older than the national average, but much older than ethnic groups with large numbers of more recent immigrants. The Canadian Jewish population has a slightly larger proportion of children (age 0–14) than the total population (18.2 % and 17.0 % respectively) and a significantly larger proportion of persons over age 65 than the overall Canadian population (16.9 % and 13.9 % respectively). There are 17,300 Holocaust Survivors living in Canada, composing 0.4 % of the country’s total senior population of 4,221,245. Survivors represent 28.2 % of Canada’s Jewish seniors. In short, more than a quarter (28.2 %) of 61,270 elderly Jews over age 65 are Survivors. Shahar, C. 2014. 2011 National Household Survey analysis: The Jewish population of Canada. Part 1: Basic demographics and Part 2: Jewish populations in geographic areas. Toronto: Jewish Federations of Canada – UIA. See: www.jewishdatabank.org. Shahar, C. 2015. 2011 National Household Survey analysis: The Jewish population of Canada. Part 9: Holocaust Survivors. Toronto: Federations of Canada – UIA. See: www.jewishdatabank.org.